2018 was also a year of working with plaster. Many of the new sculptures incorporate found objects and / or twigs. Summer 2018, I made a large sandpit to start casting cement sculptures in sand. Above are some of the sculptures that were created using this method. All were reinforced with rebar and metal. Pictured above are my newest sculptures from my summer 2016 sculpting season. 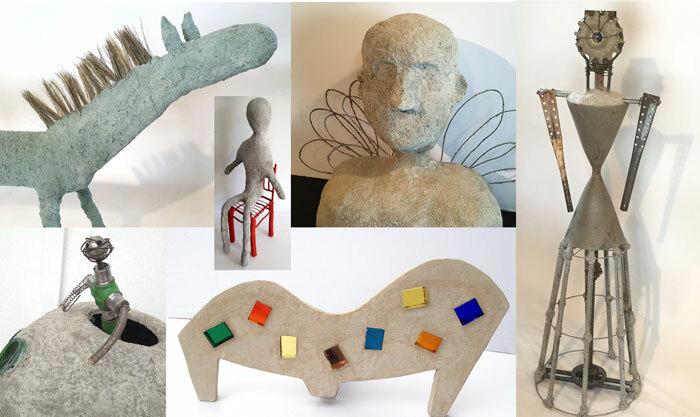 A collage of sculptures from 2014 and 2015, which includes cement and glass sculptures and ferrocement sculptures incorporating found metal objects. My creative curiosity has led me to start experimenting with cement and glass. I have had a love affair with colorful, thick glass dalles, or glass bricks as some people know them. Almost 30 years ago I made my first purchase of a big container of the glass dalles. I had seen some church doors constructed using cement and the glass and I hoped to use these same materials to create some artful projects. Fast forward 30 years to 2014 and I have now started seeing my dreams come true. 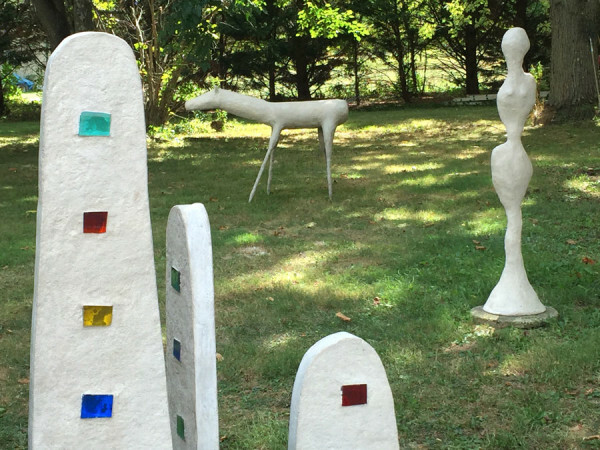 This fun cement sculpture titled “Through the Looking Glass” was a labor of love. I have so many new design ideas that I would like to fabricate for Public Art projects. The process of using glass embedded in concrete is known as Dalle de verre. Dalle de verre, from French: “glass slab”, is a glass art technique that uses pieces of coloured glass set in a matrix of concrete and epoxy resin or other supporting material. 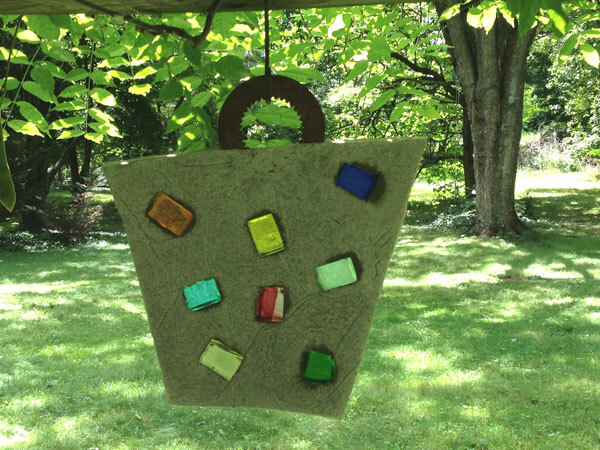 This new cement and glass sculpture is made for hanging. 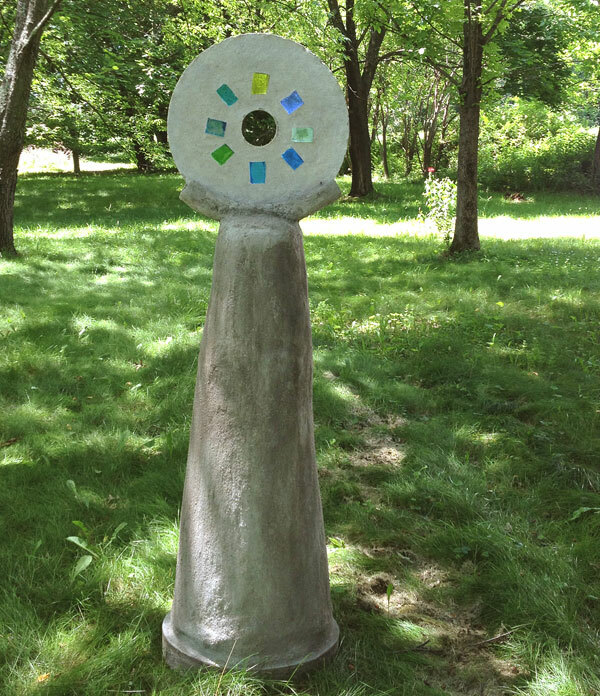 There is a metal disk embedded into the top of the sculpture. It is really beautiful when the sun shines through. This one was completed in August 2014. This sculpture was completed September 2014. 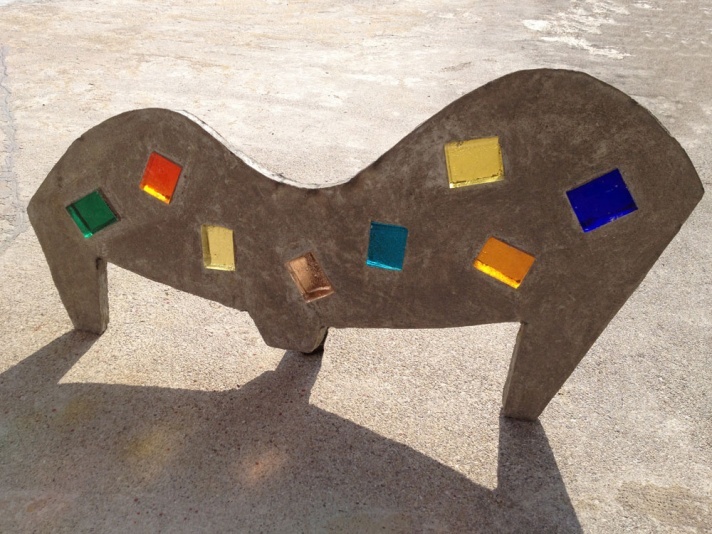 It is titled Symphony and it is a combination of chunky glass and cement. Another cement and glass sculpture. 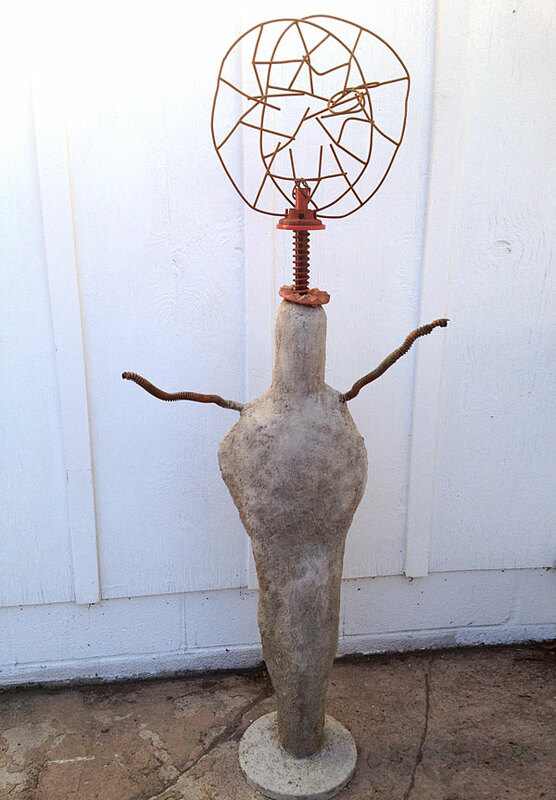 Hand-formed from cement and metal wire, this sculpture was shaped over a metal armature. The colorful, thick glass was embedded during the construction process. It stands 11 inches tall and is part of a new series of smaller sculptures. September 2014. My first 2014 hand-sculpted piece was made from thin-set mortar with mosaic tiles added to the shirt and juggling balls. It was a fun piece to create. I can’t wait to start a new one! Truthfully, I am so excited about working with cement. There are so many possibilities. I loved shaping this chair and then seeing it come to life. It’s hard work making the armature and wiring every piece together to make a very solid base for the cement but it is so worth it. 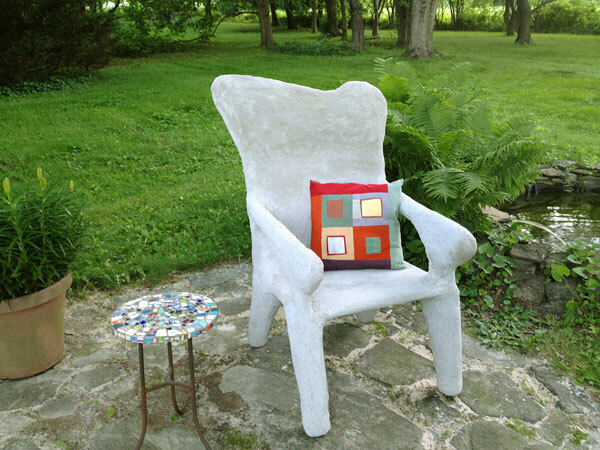 My first, of many, cement chairs! 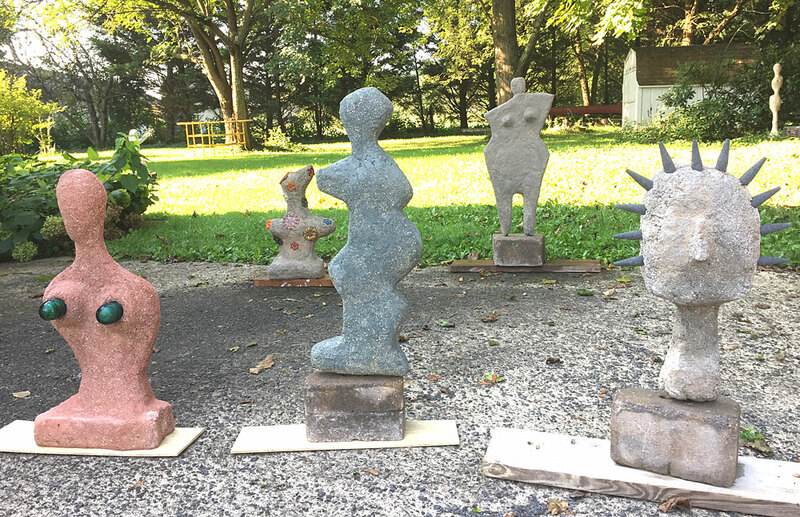 My experimentation with portland cement, sand, mortar and metal has allowed me to create some fun gallery-sized sculptures, ranging in size from 12 inches to 24 inches. Sometimes it is easiest to work with a small palette knife to apply the cement mixture but other times I only used my gloved hand to shape the figures. There are many different figures I have on my design board and some of these include the combination of cement and glass on a smaller scale. I especially like keeping the shapes to a minimum, without adding too much detail. 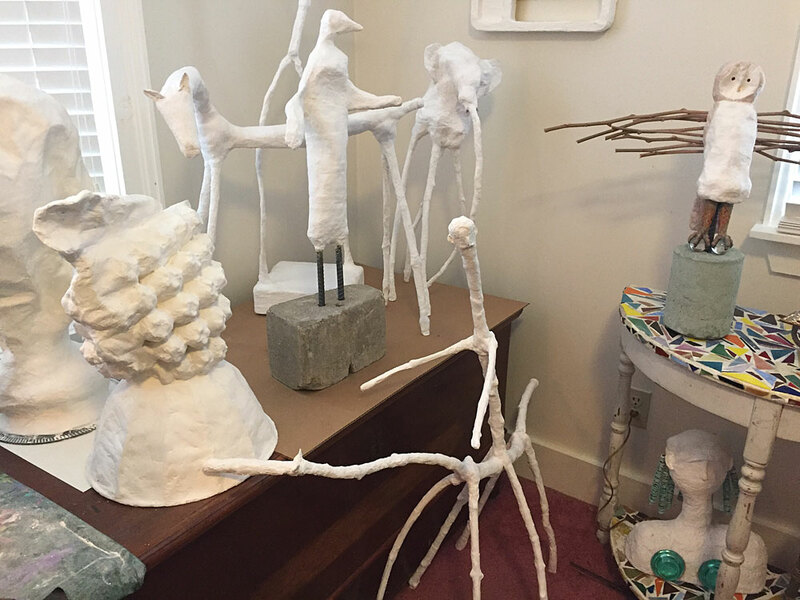 Shown here are the concrete sculptures made using metal armatures that were hand formed. (May 2014) Although some people would only call these concrete sculptures I like to refer to them as cement sculpture. 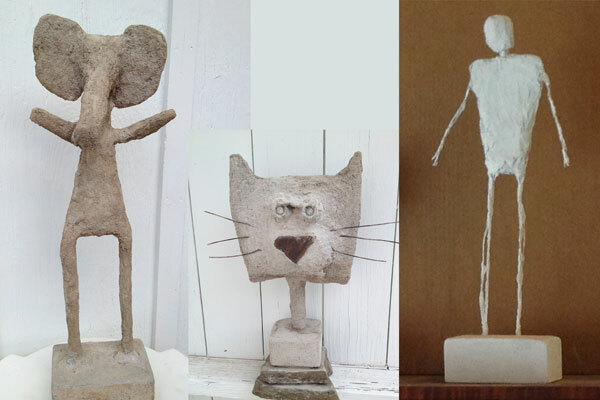 Shown here is the cement elephant with long legs, a cat head sculpture and a cement sculpture of a man, in a stylized shape reminiscent of Giacometti. This process is often referred to as ferrocement work since it utilizes both metal and cement in the creation of the sculptures. 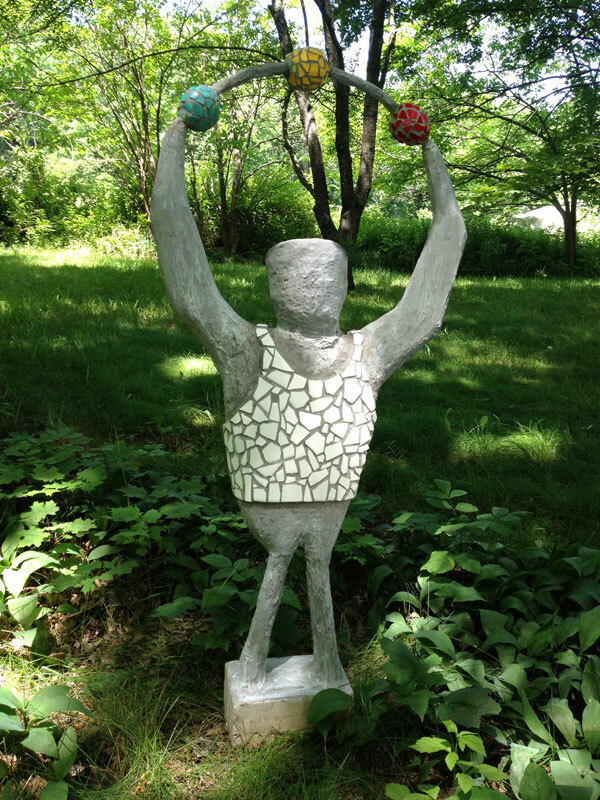 A recent large cement sculpture titled “The Intellectual”, shown below, was just finished in May 2014 and it stands about 5 feet tall. This art sculpture was made starting with a metal rod with base, then forming a metal wire armature around it. 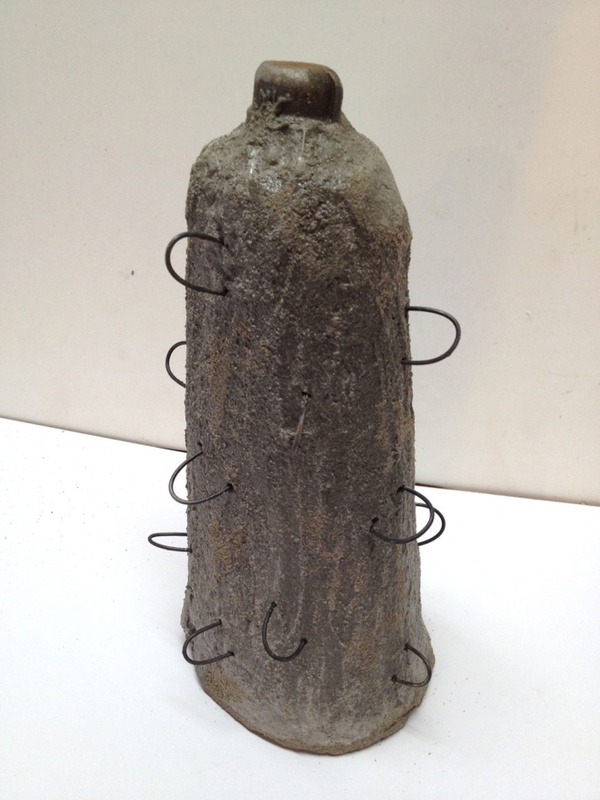 A portland cement mixture was then applied by hand, sculpting as I went. Pieces of metal, found objects were added to create this piece. Notice the round monocle that dangles from the sculpture’s head. I am still debating whether to add a piece of glass to this monocle. Over the past 30 years, I have spent some of my creative energies making fun and whimsical sculptures which I call Root Monsters. 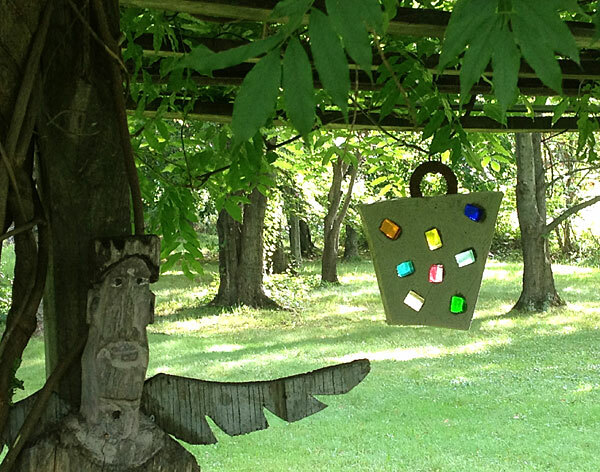 Most of these Wood Sculptures have sold over the years but I still like to make them on occasion. One of my all time favorite sculptures from a root is this wonderful piece titled Buddies. One of my neighbors, at the time, knew I was creating these fun pieces and was clearing land for their new home in North Carolina. I was living in Virginia Beach, Virginia at the time. Her husband thought she was crazy dragging this back to me in their pickup truck. But I loved it right away. I knew it would be a big bird. Once I started working on it I was blown away by the fact that the Caterpillar was so defined. Really … his eyes, mouth and nose were already there. I called it “Buddies?” as you couldn’t tell if they were friends or if the caterpillar might be eaten. I think they’re friends though. This is one piece I have not been able to part with over the years. Maybe I never will. You can see that I gave the bird checkered pants and a striped beanie, with a red propeller on top. These guys stand beside my art drawing board in my studio. 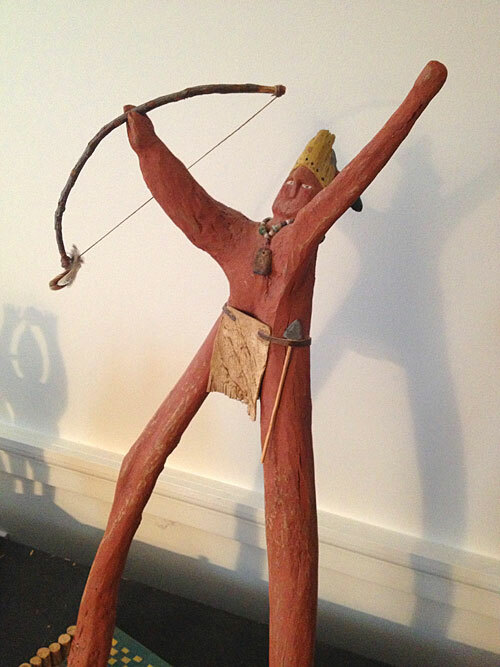 Another fun art sculpture I created started with a tree branch, once again. 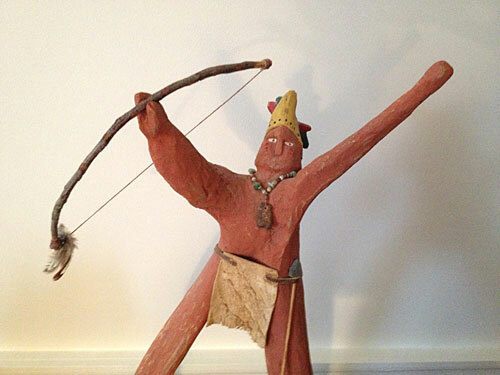 It is an Indian sculpture that is titled “The Hunter”. I utilized leather, stone, feathers and twine, in addition to a small twig for the bow. It stands on a wood base that I painted and then added pieces of tree branch, cut into varying sizes. 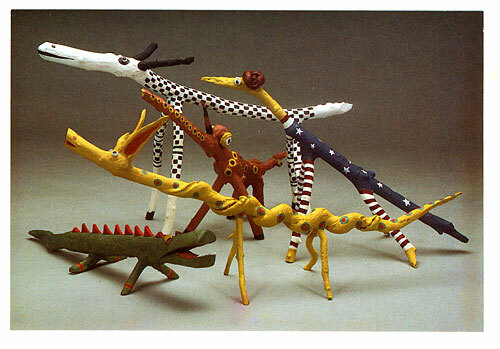 The fun art sculptures below are whimsical creatures that I created also using tree branches and limbs. They were painted with acrylics. Art Sculptures by Sharon Pierce McCullough. 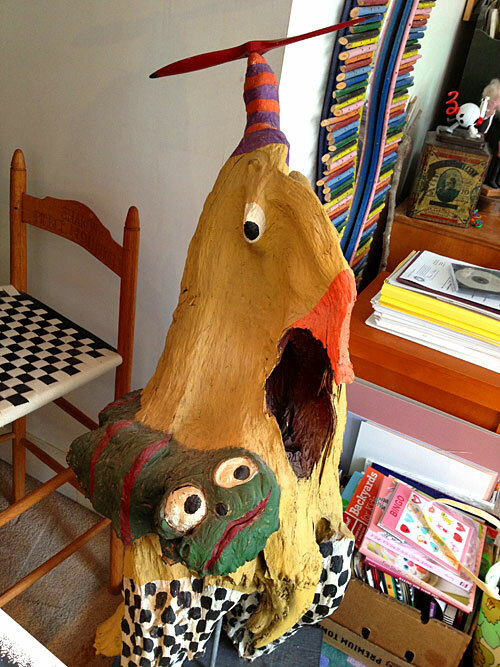 Wood sculptures, root monsters and concrete sculptures.